I'm also a bit torn about whether I should have gone with a little more dof or not, but I decided to go for a really shallow one... the ones with more dof looked a little blah. Also, I shot this intending it to be in color, but in postprocessing I decided it looked nicer in b/w [in color the background is a really pretty dark teal, so if you don't like the b/w, just pretend]. You need to shoot it from a different angle. I found that a little too much of the photo was out of focus, either that, or I would have preferred a different crop, in which more of the top of the photo is also included. That little smattering of fabric detail on the bottom right is fantastic. I love everything about this shot, the shallow DOF, the moody tones, everything just fits together wonderfully. 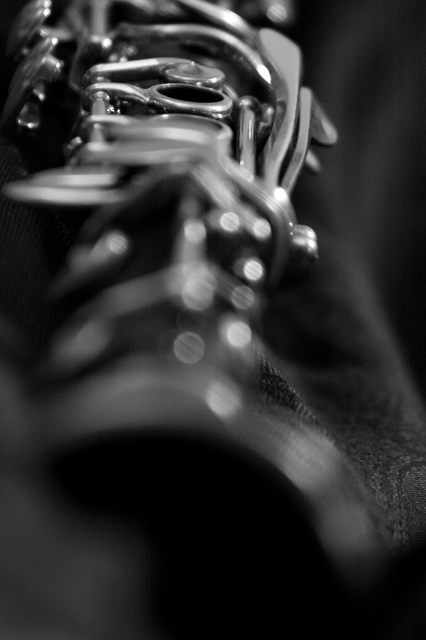 Interesting perspective on the clarinet - getting the focus only on the full view open key was a nice touch. With that, my vote is a 6 as I am looking for a story and a connection to 'School Days'. I don't think the narrow DOF is necessary here. It distracts from the instrument. Proudly hosted by Sargasso Networks. Current Server Time: 04/24/2019 01:52:51 AM EDT.